Online Marketing for businesses with big ambitions: Art Division is 10 years old this month! Art Division is 10 years old this month! 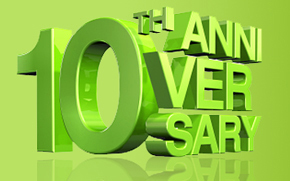 We are very proud to be celebrating 10 years in business. The business was incorporated on the 11 July 2001 and started from a small shed in Carshalton, Surrey. For 10 years we have designed and developed over 10,000 web pages, developed over 250 CMS websites, we have promoted and ranked over 10,000 key phrases on page 1 of Google, designed and developed over 1000 e-newsletters and written over 1,700 articles and web pages across the web. Of course we would not have done it without our clients. So a BIG thank you to everyone who has and especially those who still are using our services. 1. Test how Web Savvy you are by taking our quiz: http://www.artdivision.co.uk/websavvy. If you answer 10 questions correctly you can win a great prize! 2. We recently launched a New Mini Facebook Website App. Check it out. Every 10th new client who registers in July will get the start up pack set up absolutely free! 3. Register with our email marketing tool Write About Now and get 10% off the monthly fee for 10 months. 4. Most of our business comes through referrals, that's how we have managed to make it to 10 years. So if you know anyone who needs a new website, please pass us their name and if this results into business for every £1000 they spend with us we will send you a bottle of wine. The more they spend, the more you drink!